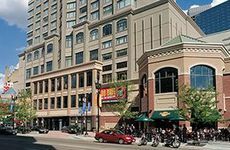 Find Loews Minneapolis Hotel deals, discounts and special offers. The business and shopping districts of Minneapolis are just a Skyway away from this luxury downtown hotel. The hotel with Minneapolis' largest guestrooms boast views of downtown and a Nicollet Mall location. The skyway connection to the convention center and metrodome make this hotel a popular choice for business and pleasure. Luxury guestrooms and suites, including Plaza Club Floor accommodations with ultra-luxe amenities. A salon, spa, athletic club access and business center are just some of this downtown hotel's amenities. Located in the heart of downtown, the hotel features a fitness center and is connected via skyways to downtown. Use the skyway to travel easily between the hotel and downtown shopping, dining and entertainment. Newly renovated, impressively appointed rooms and suites with large windows, Serenity Beds and wireless Internet access. Over five hundred rooms and suites located downtown, just steps away from many Minneapolis attractions. aloft Minneapolis is a bold new hotel featuring loft-inspired design for an easy breezy Twin Cities stay. A historical, art-deco hotel located in the heart of Minneapolis' arts district. Located just a few miles from downtown Minneapolis, this hotel offers an indoor pool and spa and an on site restaurant. Enjoy a swim at this hotel's 14th-story indoor pool overlooking the city skyline. A luxury art hotel located near Target Center, featuring high ceilings, walk-in rain showers, and a fitness center.